Vote for Alstrom Angels to win a $10,000 donation for research! CitiBank in Lubbock Texas will donate $10,000 to the winning charity. LET’S MAKE SURE THAT ALSTROM ANGELS IS THAT CHARITY! Keep those votes coming Alstrom Land! 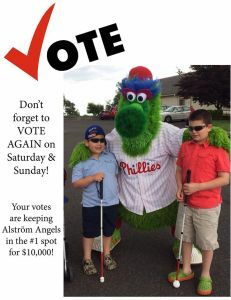 Alstrom Angels is currently in first place – You can vote once per day for each of your email addresses.